Do you remember Souper Salads? It was a buffet place where you could dump all the soup and salad ingredients you could eat into your bowl and then pig out. Black and Blood is sort of like that with various shades of death metal, speed metal and heavy metal riffs. In that, it more resembles the South American scene than Boston, where it’s putatively from. 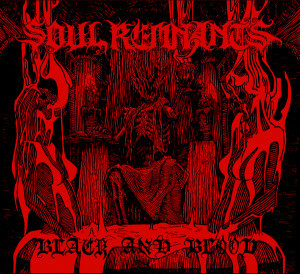 The review cheat sheet for this album describes it as half old school death metal and half Norwegian black metal. That’s not quite correct: it’s mostly mid-period death metal in the Suffocation Pierced from Within and Death Symbolic model mixed with melodic death metal riffs from guitar-heavy bands like Carcariass, set to the song format of stadium heavy metal. The result is a tour through the years of heavy metal with a guide who clearly enjoys the process. Soul Remnants songs stick together on pure gut feeling. No complex theory here but riffs tied together for maximum contrast when necessary, but otherwise, a feeling of organically interrelated pieces. Underneath that there’s intense blasting and strong linear basslines, giving this a feeling of power. Black and Blood borrows most intensely from stadium heavy metal of the 1980s, building up these songs like power ballads and giving them some emotional intensity. Vocals are modern death metal as is the tendency to mix and match riffs, but within that format the heavy metal breathes through and takes over. What emerges from this ferment is a listening experience that evokes the greatness of metal in a humble but energetic way. The resulting product is a flow of interesting guitar work that, while often allusive to past metal genres, keeps enough of its own voice to carry its own songs.